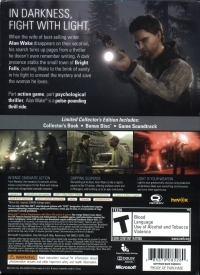 Box Text: Bringing a new style of storytelling to Xbox 360, "Alan Wake" is a psychological action thriller from Remedy, the renowned developers of the successful "Max Payne" series. 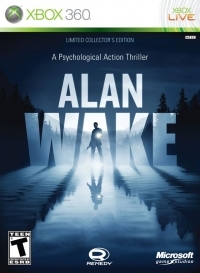 In this dynamic new title exclusively for Xbox 360, players assume the role of Alan Wake, a best-selling suspense author suffering from writer's block, who escapes to a small town only to experience the mysterious disappearance of his wife. This is a list of VGCollect users who have Alan Wake - Limited Collector's Edition in their Collection. This is a list of VGCollect users who have Alan Wake - Limited Collector's Edition in their Sell List. This is a list of VGCollect users who have Alan Wake - Limited Collector's Edition in their Wish List.